Hello! I’ve got on last version of your theme this bug “if the category description height is shorter than the latest link div height”. How to fix that? please tell me. The “See X new or updated topic” bar is rounded in a way that creates a small black triangle in the corner below it. I’m torn on whether this should stay rounded, or if it should be flat on the bottom. The dropdown on the /groups/groupname page has an unevenly rounded highlight when hovering. This dropdown (also on /group/groupname) stands out. Not only as square, but also with the colour. The unread notification bubble on posts is misaligned. Would it be possible to make it so that I can set the highlight duration to 0 to turn it off? I also feel I should clarify this one, because it seems it was misunderstood (even though it was quite a while ago). It was purely in relation to the edit. I was promising not to make a habit out of doing sneak edits like those, not to not make a habit out of posting these. You can trust me that I’ll always report it if I find a bug, even if I usually wait until I have a couple before reporting. The main reason I haven’t posted here in a while is that there haven’t been any notable bugs. Which really is a positive thing. You also don’t have to spend more then you have to on these amazing bug reports. If the screenshots clearly indicate what the problem is, I’m completely fine with a post that only has screenshots and no text. If I can’t find the problem I’ll ask for clarification. Yeah. While writing these I often go back to take better screenshots even though the description I write should explain it well enough. And vice versa, the screenshots are often enough that I feel I don’t need to write an explanation to go with it. But I still choose to write them. It’s mostly to clear my head and to make sure these are coherent. Adding a little comment to everything makes it easier to sort them into groups of similar problems. It also gives me quite a bit of time between I start writing these and I finish them. That makes it easier for me to spot mistakes I’ve made when I do the revision pass because I’ve then already forgotten the spesifics of what I was writing earlier. I see that you reference just a single font style. If I’m not mistaken, this means that each time your theme uses other font styles (like bold or italic), it calculates them algorithmically instead of using a dedicated font file (which usually looks better). You should see the difference once you refresh the page. All bold text will look smoother. unfortunately, Assistant doesn’t have italic styles. You’re pretty much dead-on there. The short answer is performance - Mostly because Vincent is supposed to be a template or a starting point and not an end product. 1- The starting point for the default font is on the “right” side for synthesis (thin, straight) as opposed to (bold, italicised) which makes the synthesis of the variants a bit easier. 2- The included font is the bare-minimum. Everyone will need a font. Different people will need different font variants. So, while it makes sense to ship the theme with one distinct font (variant) that matches the rest of the style of the theme, it would be difficult to justify including more than that - unless the vast majority of people use them. 3- Each font file adds overhead. The amount of overhead depends, but in general it would be 15kb and 1-2 http requests per file/variant - gzip aside. This might not seem like much, but if you compare 15kb (font file size) to the entire size of the theme 67kb (including the background! - gzip aside) - then the size of each font file becomes a lot more… prominent! OTOH, your code will be a template for other people, including those who may not know the difference between synthesized styles and designated styles. Whatever you decide, it will promote either good typography or good performance practices. I pushed a tiny fix for the issue @_vincent. I am still aware of the other issues that have been raised and will get those sorted as well. A few bugs I’m noticing. First off is in the standard Samsung web browser on a Galaxy S8 the text doesn’t appear to go more than 4 characters before starting a new line. That makes the topic titles look really disjointed. It also doesn’t appear that the custom category images play nice with the latest post. Lots of overlap there. It looks significantly better on the Chrome mobile app, but there’s some weirdness with the Category badge colors wrapping around the category list. So you get this mixture of colors on the top & bottom borders on top of the flourish of color you get to the left of the category title. Let me know if you’re able to reproduce this. This should be a clean install. It sounds like you’ve manipulated default text size in your OS settings to make it xtra large. Can you provide screenshots? I did crank down the text to Tiny through the OS and it still appears like such. Could be a configuration error on my end, just not sure what exactly. I’ll update the browsers just in case as well. Updated to latest versions, cleared cache, still present. 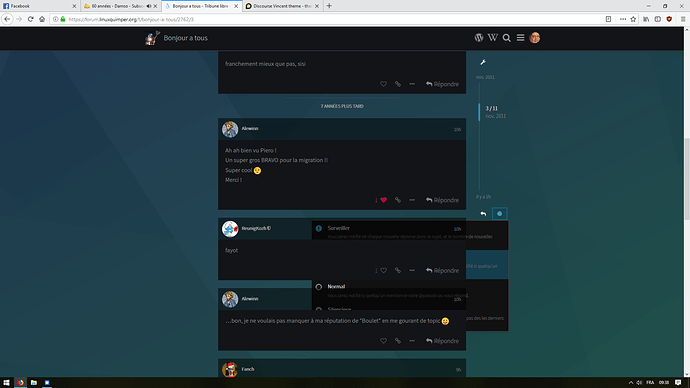 It looks like you’re viewing the site in desktop view. Try switching to mobile view in the hamburger menu. Bingo. Looks like it was in Desktop mode. Any ideas for screenshot #1? That doesn’t seem to happen in Desktop view, but still does in Mobile view. May be missing something here, but I’m having some issues with the custom BG images with the categories. Tried a few different lines but doesn’t seem to make any difference. Ideas? to a theme component and then add that component to the theme. I’m having some issues with the custom BG images with the categories. Tried a few different lines but doesn’t seem to make any difference. Ideas? I’m not sure I follow, how are you adding the category backgrounds? Can you share a link to your site so I can have a look? You can see the repeated background on category pages. Unless I’m missing something (new to Discourse so could be) this should be the Vincent theme with a few minor changes. 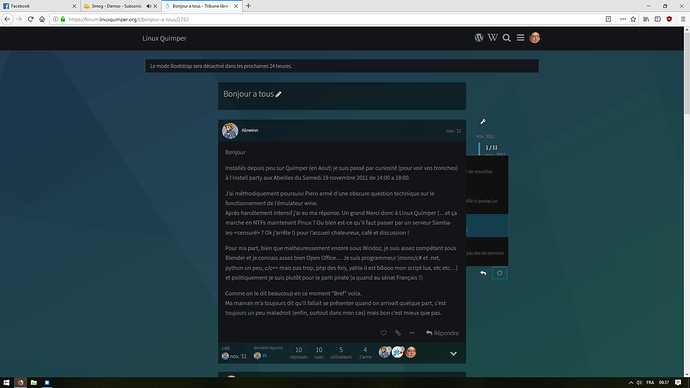 The background on the homepage is set by the theme and everything looks OK. the backgrounds on category pages are added by Discourse since you added them in the category settings. There was a small issue with the CSS of the theme that was causing category backgrounds to repeat. The category background issue is now fixed. Please update the theme. Thank you for reporting. 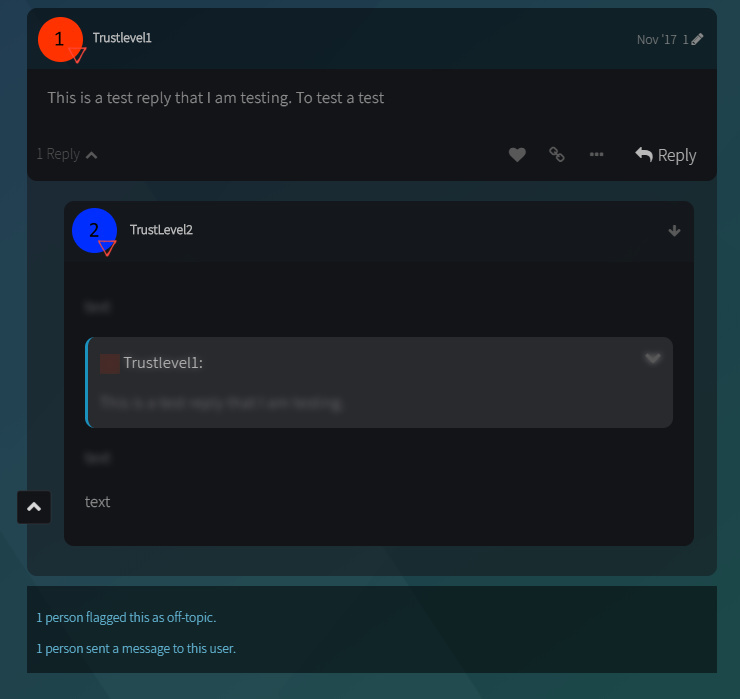 I’m not sure how you are making the changes to the theme but your changes should live in a separate theme component and you should not be making any changes to the theme directly. If there’s an update - like there is one now - you would lose your custom work.